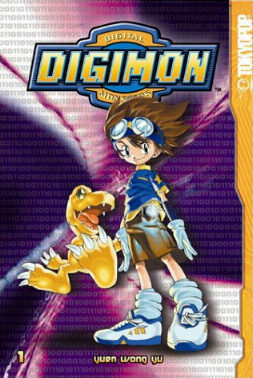 Adapts "And so it begins..." and "The Birth of Greymon"
Seven kids find themselves transported into another world, where they encounter strange "digital monsters" - Digimon. Their search the missing member of their group, Mimi, is successful, but she is being chased by the monstrous Kuwagamon, who pursues all the kids to a cliff edge. The kids' Digimon Digivolve into their Rookie forms to battle him, forcing him back slightly before he bites off of the cliff edge, sending them plummeting into the river below. They wash up on a beach, where attempts to call for help on strange public phones prove futile. Then, as they eat, they are attacked by Shellmon, who steps on Agumon, and seizes Tai. Chapter Two: "I'll Have Mine Super Sized"
Adapts "The Birth of Greymon" and "Garurumon"
To save Tai, Agumon Digivolves into Greymon, and blasts Shellmon out to sea. Then, the kids head into the jungle, and after narrowly escaping some Monochromon, find a trolley car on an island in the middle of a lake, and spend the night there. Tai stands watch, but embers from his campfire awake Seadramon, who drags the island around by his tail. T.K. is thrown into the water, and Matt dives into save him, but after he does so, he's grabbed by Seadramon, and Gabumon Digivolves into Garurumon to save him, only be frozen solid by his Ice Blast. Chapter Three: "Rising From The Ashes"
Adapts "Garurumon" and "Biyomon Gets Firepower"
Garurumon breaks free and takes Seadramon down, leaving the kids to explore further during the day. After traversing a forest full of road signs, they wind up in the desert, where Tai spies a village, only to find out that it's smaller than it looks, and is occupied by Yokomon. The village is attacked by the flaming Meramon, who has been driven insane by a mysterious Black Gear that has imbedded itself in his body. The Yokomon are herded to safety by the kids as Biyomon battles with Meramon, Digivolving into Birdramon and blasting the gear out of him. Meramon remembers nothing of what has happened, and the kids and Digimon eat with the Yokomon. Chapter Four: "Izzy Meddles With Technology"
Adapts "Kabuterimon's Electro Shocker" and "Togemon in Toy Town"
Chapter Six: "Batteries And Malicious Intent Not Included"
Adapts "Togemon in Toy Town"
The supposedly-friendly Monzaemon attacks Mimi and Palmon, trying to take them to Toy Town, but a Numemon helps them to hide from him. They then make their way to Toy Town, where they find the other kids brainwashed, letting toys play with them, and the other Digimon trapped in a chest. When Mimi stomps on a toy, Monzaemon attacks again - the Numemon try to fight him, but are no match, prompting Palmon to Digivolve into Togemon, and knock a Black Gear out of Monzaemon. To thank the kids for freeing him, Monzaemon uses his Hearts Attack to fill them with good feelings. Chapter Seven: "Joe and Gomamon's Eggcellent Adventure"
This manga is part of Tokyopop's "100% Authentic Manga" line, printed in its original right-to-left format. However, unlike the rest of this line, the English language version is not just a straight translation, but is, like the dubbed cartoon, tweaked in a few places for the sake of humour. However, everything about the manga is preserved, and none of the new dialogue is included with intent to cover up or change things, the way the cartoon sometimes worked. Further, dub names, attacks and other terminology are used, except T.K. 's name is spelled as "TK" without the periods.. The manga begins in media res, starting up with the kids already in the DigiWorld, with six of them together, searching for Mimi, rather than split up, as with the cartoon. We are filled in on the details of how the kids came to the DigiWorld in flashback form only. In chapter five, the manga makes no attempt at hiding the fact the Numemon are hurling their poo at the kids, the way the dub of the cartoon did. In fact, it is made a point of humour, getting as many wacky lines out of Tai as possible containing the word "poo," (hence the title) to the point where Mimi asks him to stop saying it so much. In response, Tai decides he'll call it "sludge" - just like the dub of the cartoon called it. In the following chapter, Mimi refers to it by its full dub cartoon name, "Nume Sludge."